Just because you can’t make it to the gym doesn’t mean you can’t squeeze in a great morning workout. Today I’ll show you the surprising hack to get a rigorous, total body workout anywhere, from the living room to the hotel room. Make a traditional push-up more challenging by adding isolated holds. 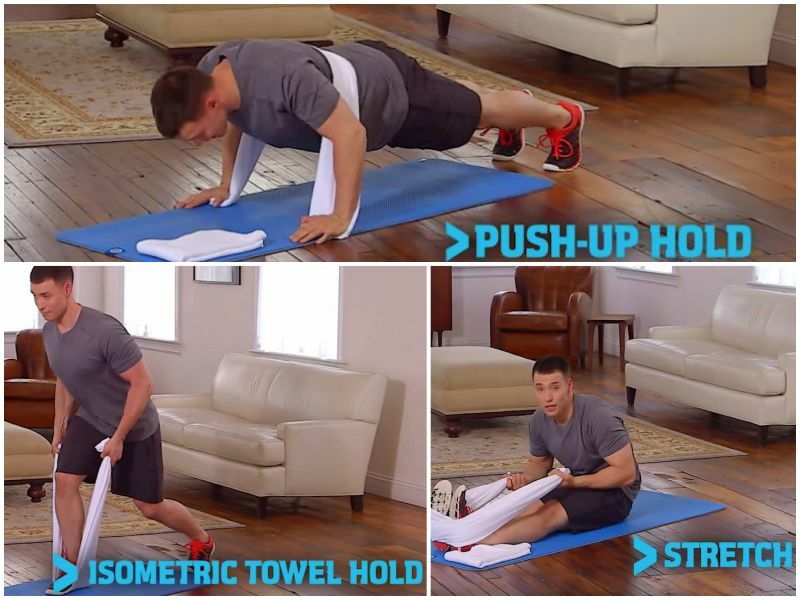 Wrap the towel around your body at your lower back and get into a push-up position. Anchor the towel under each and create tension by pressing up into the towel. Hold the move for 20 seconds and see how many 20-second holds you can do. To target your back, assume a split stance with you right feet foreward standing on the towel. Keep your chest up and pull the ends of the towel as hard as you can. Squeez your shoulders together and keep your elbows toward the ceiling for as long as you can. Don’t forget to stretch! Can’t touch your toes? Sit down with your legs extended and put the towel at the center of your feet. Grab both ends of the towel and pull yourself toward your feet. Hold for at least 30 seconds or until you feel like you’ve gotten a good stretch. Start your day by doing these moves first thing in the morning. Don’t forget to choose healthy, high-protein snacks throughout the day. Stay fit!